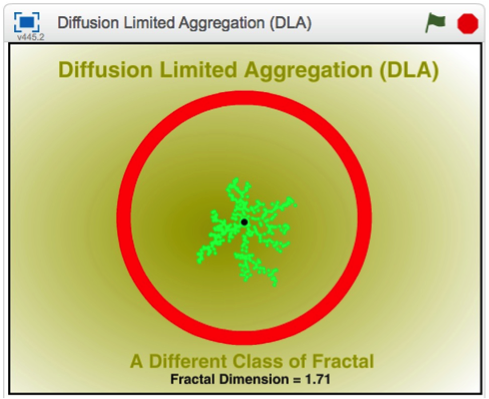 Diffusion-limited aggregation (DLA) is the process whereby particles perform random walks (Brownian motion) and aggregate (stick) together. 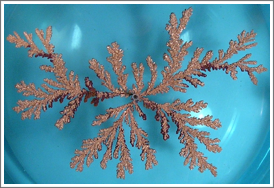 DLA can be observed in many systems such as electrode position (see picture below), mineral deposits, and the breakdown of an electrical conductor when the voltage exceeds the breakdown voltage of the conductor. limits the growth to essentially two dimensions. Thomas Witten (1944 – ), an American theoretical physicist, pioneered the study of diffusion limited aggregation. Here is a screen shot of the Scratch project after a run. Scratch has a 300 clone limit so there are not enough particles to create fully developed DLA like the one shown in the photograph but even 300 agents reveal the structure associated with DLA. You can view and download this project from the Scratch web site by clicking on the following link. If you view the project on the web site or download it Click on the green flag and be patient. It takes less than 3 minutes for the project to finish. All processes in nature take time. Some take a few billionths of a second, others, millions of years. A document detailing the programming of this project is available on request. Send an email to grandadscience@gmail.com.